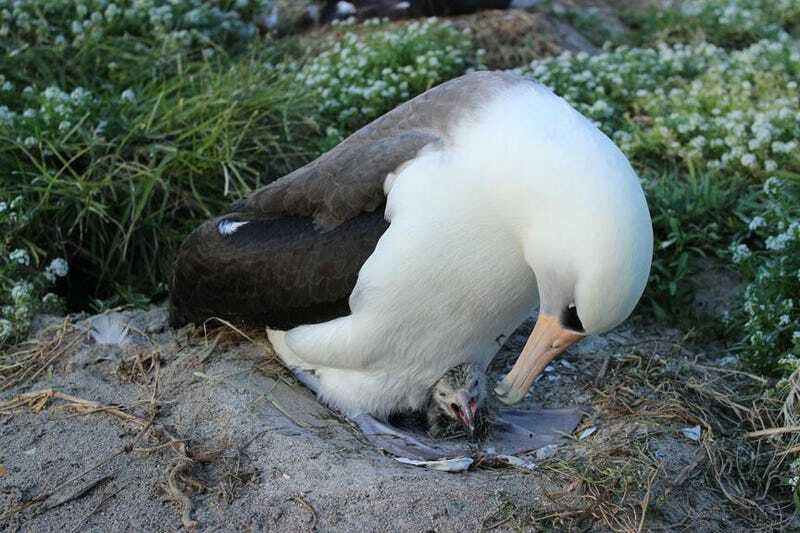 The world's oldest wild bird has given birth! Things you may not have known, but probably should know because they're fantastic, in no-particular-order of fantastic-ness: 1) The world's oldest known wild bird is a 63-year-old female albatross. 2) Her name is "Wisdom." 3) Wisdom just gave birth. She provides to the world valuable information about the longevity of these beautiful creatures. In the case of Wisdom, she has logged literally millions of miles over the Pacific Ocean in her lifetime to find enough fish eggs and squid to feed herself and multiple chicks, allowing us the opportunity to measure the health of our oceans which sustain albatross as well as ourselves. Both parents are necessary for feeding the chick, so their safety at sea is always a concern. Finding enough food, avoiding fishing lines and nets, and avoiding the frightening abundance of plastic pollution are all key. Unfortunately, many chicks die as parents mistake plastic objects for food, such as cigarette lighters, toothbrushes and fishing floats, and bring it back to feed to the chick along with the flying fish eggs that are a staple for the growing birds. Their stomachs fill with the indigestible objects and they end up starving to death.